Going to Italy was a dream I’ve had for so long that deep down, I thought it would never come true. I have two uncles who both lived in Italy for a time and I grew up on their enchanting tales of cobblestone streets, rolling countryside, rustic Italian cooking, and tales of the most incredible cities in the world. Then, one banal morning in April, as I was loading the dishwasher, everything changed. After an intense 30 minutes, my husband and I booked tickets to Italy, a country we’ve never been to, on what seemed like a whim. There was a definite freak-out moment as we wondered, What did we just do? Six months later, it turned out to be one of the most incredible experiences of my life. We did an entire Italy trip in nine days, in under $1,300 per person, including flights! We went the first week of October and the weather was beautiful. The country is absolutely stunning with ancient history and romance at every piazza and spaghetterria. Since coming home, I’ve had so many people ask for details and recommendations of our trip that I decided to lay them out here. Book lodging in each city. We did Airbnb and it was fantastic. I was a bit worried booking an Airbnb internationally, but every accommodation went smoothly. Each host communicated via email several times before our trip and met us at the apartment. They even gave us their best local tips and maps of the city. Book train tickets to each city. It’s important to coordinate each termini location with your lodging. We usually walked about a mile from the termini location to our apartment. Buy important tickets in advance. Depending on where you are going, you’ll want to book as many landmark locations in advance to avoid incredibly long lines. Places like the Vatican Museum (where you’ll see the Sistine Chapel) in Rome and The Accademia Gallery Museum (where you’ll see Michelangelo’s David) in Florence. Learn some Italian. This was incredibly helpful. I printed out several lists of conversational Italian and even took a 3-month Rosetta Stone course in Italian. I was amazed at how much it helped me interact with locals, read signs, and order in restaurants. Since day one was purely flying, Day 2 in Italy was our arrival to Milan, a global fashion capitol. Our inexpensive plane tickets were to Milan, so we spent a short time here before spending the bulk of our time in Rome, Florence, and Venice. 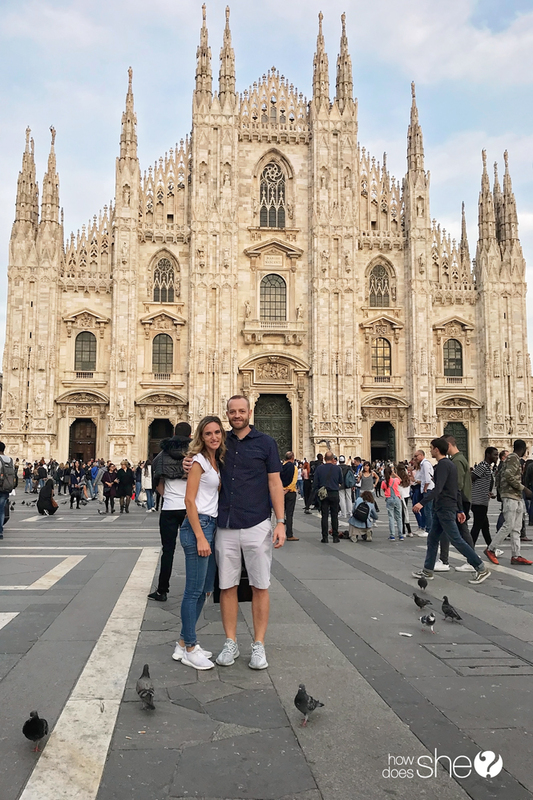 Duomo di Milano: It’s no wonder this breathtaking church is the backdrop to endless selfies—it is absolutely stunning. The Duomo also houses the Crypt of Saint Charles. You’ll want to buy tickets in advance if you want to go inside. The Convent of Santa Maria delle Grazie is where Leonardo Da Vinci’s The Last Supper resides. Cool fact: this famous painting no resides in its original place, on the very same wall. You can get tickets here. The Galleria Vittorio Emanuele II Shopping Center: This historic landmark and high fashion mall is right across from the Duomo di Milano and a must-see, if only for the window-shopping and people-watching. Here you’ll find Prada, Versace, Gucci, and Louis Vuitton, along with other elite fashions. Until my dying day, I will not forget my swift and unexpected love affair with Rome. The grandeur and wonder of this city is as large-scaled as its ancient architecture. To walk the same paths as Roman soldiers, to be in the same room as Michelangelo once was, and to witness with your own eyes his ethereal Sistine Chapel—it was life-changing. When in Rome, do as much as you can, see as much as you can, and eat as much as you can. I wish we could have spent at least two more days here. We did a lot, and our pace was fast, but I know there was still much we missed. Rome is a large and expansive city that requires some mode of transportation. We solely used the metro system and then walked to our destinations. Once you get the hang of the metro in Rome, it is really a very quick and convenient way to traverse the city. The Collosseum and Palatine Hill: Absolutely astounding. A must-do. You can buy a Roma Pass that allows you to skip the lines at several Roma sites. Vatican City, The Vatican Museum (home of Michelangelo’s Sistine Chapel), Saint Peter’s Basilica: Although there were wall-to-wall people there as we worked our way through the Vatican Museum, it was still breathtaking. Your walk through the museum culminates with the Sistine Chapel and is a true grand finale. I was unprepared for the reverence and awe this masterpiece commands. The Trevi Fountain: Absolutely beautiful and another awe-inspiring moment. There are also many great restaurants, gelaterias, and cafes around here. Spanish Steps, Piazza del Popolo: A fun place to hang out, eat, and shop. The Roman Pantheon: built in 113 AD and is one of the most impressive structures I have ever seen. It’s free to go inside and you simply have to see the incredible skylight that was so perfectly constructed in those ancient times. Florence is a charming and unexpected city full of beauty, art, and exploration. I suggest approaching Florence as a choose-your-own-adventure in the fact that my favorite part was just wandering around, getting lost in the labyrinth of the city. Even if you’re not big on art, you simply must visit the Accademia Gallery Museum in Florence where Michelangelo’s statue of David calls home. It is an astounding experience to be in the same room as this magnificent sculpture. Aside from taking the train to get there, we mainly walked all over Florence. The streets are quite narrow and renting a Vespa would be fun, but we stuck to walking and found that we were able to get pretty much everywhere we wanted, plus walk off all of that pizza, pasta, and gelato we were steadily consuming. Walk across the Ponte Vecchio Bridge. There are lots of shops along your way here that are fun to peruse. Stop and listen to street musicians. One of the most charming and unpublicized things about this city. See the statue of David at the Accademia Gallery. For me, simply astounding and an absolute must. It’s such a hallowed experience that I don’t want to post pictures. It’s something you really need to see for yourself. Buy tickets in advance. Visit the Uffizi Gallery. I’m not a huge art fan, and so I was surprised at how much I loved the Uffizi. Seeing such masterful paintings by Botticelli, Michelangelo, and more was both moving and fascinating. Climb the Piazale Michelangelo for an incredible view of the city. You’ll get gorgeous pictures here. Go to the San Lorenzo Market. I’m still lamenting over the Italian leather jacket I didn’t get here. When I go back, I will definitely snag one. But I did get lots of delicious Italian candies for the kids and we ate some delicious Italian food here. They will even dry-pack your cheese so you can travel with it. See the Florence Duomo. We waited in line for about an hour and a half to enter this beautiful cathedral. It was free to enter, but you can buy tickets in advance to visit the baptistry and climb the dome, which would be amazing. Eat anything and everything. We had the best cannoli of our lives here in Florence. From Florence, we took the train to Venice, where immediately upon exiting the termini, we were met with the unforgettable view of the Grand Canal. Venice immediately enchants you with its waterways and reason-defying architecture. Huge buildings are literally built on underwater wooden foundations that have been preserved for centuries. In lieu of streets, you get winding waterways that weave in and out of the city, gondolas gliding through narrow passageways, and charming bridges connecting you to restaurants and shops. We splurged on accommodations in Venice and stayed in a room with a view of the Grand Canal and it was worth it. Waking up to the lapping of water outside our big, open windows and eating croissants as we watched the boats below was heaven. Took the water taxi. The easiest way to get around the city. Went to Doge’s Palace and wandered the restaurants and shops there. Had a gondola ride. A bit touristy, but something you just have to do in Venice. Walked over the Rialto Bridge. There are lots of shops and restaurants here. Wandered through the narrow city streets. Bought an Italian suit. Italy is known for their suits, and my husband bought a very handsome one for a good price. Ate authentic Italian. I ate the creamiest risotto and the most simple and delicious pizza here in Venice. The majority of travel is by water, specifically the water taxi, which is literally the public transportation system in Venice. You can buy a 24-hour or 72-hour pass which allows you to get on and off the water taxi as many times as you want. Other than that, just wandering the streets on your own two feet is the best way to go. Our nine-day trip to Italy was fast and furious, packed with art, culture, food (so much incredible food! ), history, and surprise. Italy was everything I dreamed of and more, because now it is mine. Those cobblestone streets are my experience and I left a piece of myself in each city. #1: Just go. Book a flight and the rest will fall into place. #2: Eat everything. Friends have asked about where to eat in Italy, and my response is, think more in terms of whatto eat. Rather than a list of restaurants to visit, make a list of foods you want to eat. Risotto, gnocchi, ravioli, pizza, lasagna, tiramisu, gelato…then use Yelp to look for restaurants as you are in different sections of the city. We never had a bad meal in Italy. #3: See everything you can: We didn’t get to everything. I think we made a good dent, but there are so many things I still have on my list for next time. Oh yeah, we’re already planning next time and you’ll want to too. Italy is a country you can’t help falling head over heels for. Arrivederci! Our family wants to plan a trip in the summer, how did you find tickets for$500? Was it just a lucky find? I can’t believe you made that budget😁 I definitely need to start searching! Awesome! I subscribe to a few “cheap flight” emails and that’s how I found our $500 tickets. Check out Pomelo Travel…they have a free email and then a $30 subscription, which I recommend if you want to find the deeply discounted tickets. The catch is, you have to book sometimes within hours or the price spikes back up. It was an intense hour while we were decided whether to do it or not, but so worth it! And if you’re going with family, it helps your budget to share lodging. And the train tickets are very reasonably priced. Have so much fun! Loved reading about your adventure in Italy! My husband and I also daydream about going on a similar trip (Into Milan and through Venice, Rome and Florence) and are hoping to go sometime in 2020. Do it! You will have the most incredible time. For us, it was all about taking that first big step and just booking plane tickets. Then we were locked in! So, so glad we made it happen. We are going in 6 weeks and staying in Rome with day trips to Naples and Florence. Then to Venice with a trip to Milan. We plan to use the bullet train, I know it is more expensive, but would buying a Eurorail pass help with that. I have heard different views. We just booked a trip on the whim too! Found 2 tickets R/T for $939 including bags! The best part will be celebrating my birthday there! We are doing CT Riomaggiorre instead of Rome. How far in advance did you book city to city trains inline? Also how far in advance did you book you air BNB? We will also be there in October and hope the weather is perfect! Loved your trip recap!